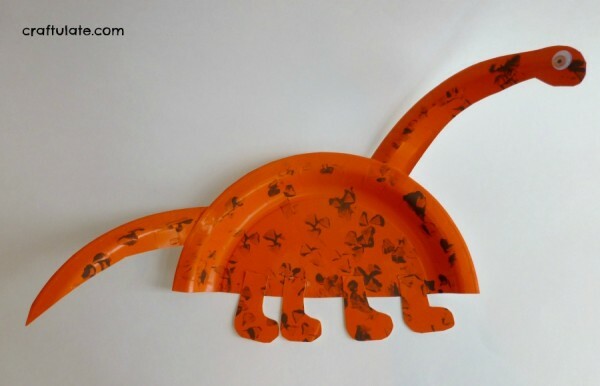 For this craft we made a Brachiosaurus from an orange paper plate, a triangle cork stamper I made a few months ago, and brown paint. F stamped all over the paper plate and then we left it to dry. I cut up the plate into a body piece, neck and head, tail, and four legs. F glued the pieces together (with a little help for the neck and tail) and then added a googly eye to the head. 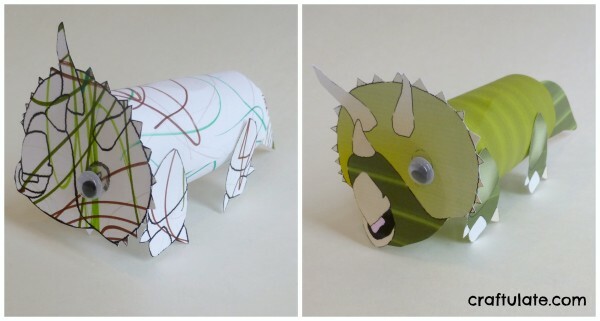 This cute triceratops printable comes from DLTK-Kids – and is available in a colour or black and white version. 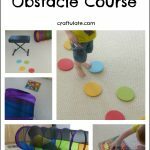 I was going to design my own but it’s not really my strong suit – and there are so many great free resources around! First F coloured the black and white version with a variety of green and brown pens and pencils. While he was napping I cut out the pieces and attached 1/2″ glue dots to the relevant areas so that he could assemble the dinosaur when he woke up. He did everything apart from the tail which he asked me to do. Some of the feet were on the wrong sides and the head had a rather jaunty angle, but it didn’t matter! I decided that we should make some artwork using some dinosaur cookie cutters (from this set) and shaped sponges that we have. 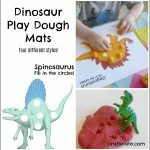 The dinosaur shapes included Tyrannosaurus Rex, Pterodactyl, and Stegosaurus. We used brown and green paint and F made prints all over some brown card. However, I was slightly underwhelmed by the final result, so we used it as a background for adding some dinosaur stampers and also some foam stickers that were sent to us by our friends at craftprojectideas.com. Here’s the finished mixed-media collage! 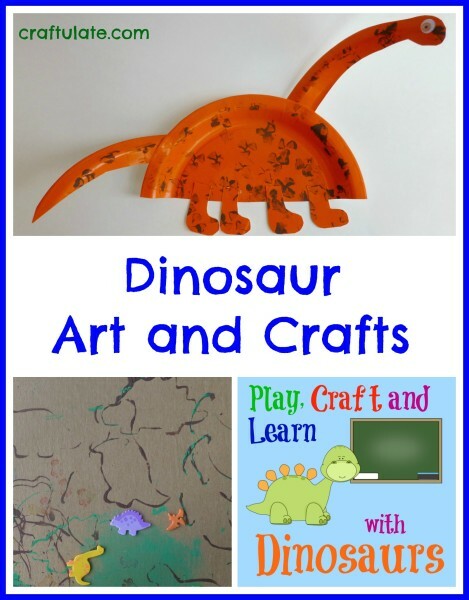 We painted the dino pictures together from our Melissa & Doug Paint with Water book. 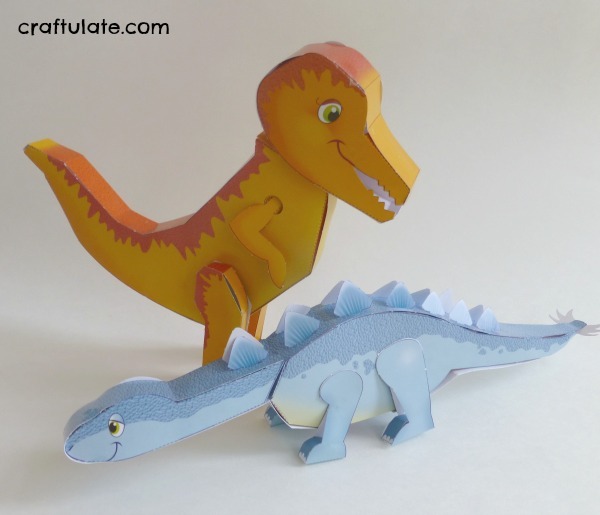 It’s been a while since I did some papercraft and I couldn’t pass up an opportunity to make this Stegosaurus and T-Rex from my Big Bumper Book of Paper Models. It was well over a year ago, but this dinosaur pop-up card that we made for F’s cousin was a real joint effort! 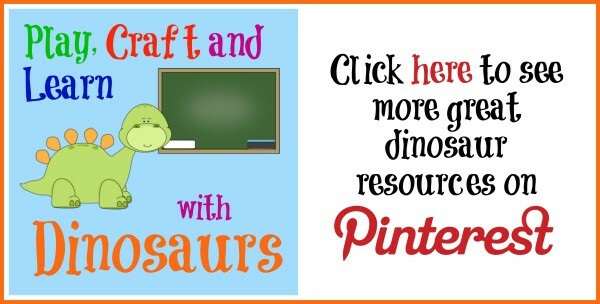 This post is part of the Play, Craft and Learn with Dinosaurs series, so please check out the rest of the team for more dinosaur art and crafts! just love that paper plate dino!! So many great crafts! Can’t believe you were able to make that dino with just one plate. Thanks Wendy! The newsletter sign-up had disappeared for some reason – it’s now back top left of the screen. Oh wow they are amazing – especially loving the tube one.